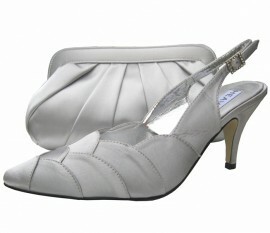 Stunning satin silver evening shoes by the designer Heavenly. Elegant closed toe ladies shoes with feature scalloped detailing across the foot. Slingback ankle fastening for elongating your legs and a diamante encrusted buckle for that touch of sparkle. 3" satin covered heel. A matching clutch bag is also available to match these stunning silver evening shoes, style code MENM2.